Science Quiz: Which came first? Try our science quiz. It’s just ten questions. Decide which of the following events came first to test your knowledge of scientific progress. In each question, the two events compared are always at least one decade apart – usually more. Come after the images below each question. Check what your score means at the bottom of the page. Are you an Einstein, or… ? 1. The discovery of the first Neanderthal skull or the discovery of the Rosetta Stone? The discovery of The Rosetta Stone – 1799, Pierre-François Bouchard in Egypt – came before the discovery of first Neanderthal skull – 1829, Philippe-Charles Schmerling in Belgium. 2. The discovery of infrared radiation or the first use of rabies vaccine? The discovery of infrared radiation – 1800, Sir William Herschel – came before the first use of rabies vaccine – 1885, Louis Pasteur/Pierre Roux. 3. The discovery of irrational numbers or the first use of negative numbers? Irrational numbers – c. 520 BC, Pythagoreans – came before the first use of negative numbers – c. 200 BC, Han Dynasty mathematicians. 4. The discovery and isolation of the hormone insulin or the discovery of radioactivity? The discovery of radioactivity – 1896, Antoine-Henri Becquerel – came before the isolation of insulin – 1921, Frederick Banting and Charles Best. 5. The discovery of hydrogen’s isotope deuterium or the invention of radiocarbon dating? The discovery of hydrogen’s isotope deuterium – 1931, Harold Urey – came before the invention of radiocarbon dating – 1947, Willard Libby. 6. The invention of the Richter Scale for earthquake measurement or the discovery of the electron? The discovery of the electron – 1897, J.J. Thomson – came before the invention of the Richter Scale – 1935, Charles Richter. 7. The invention of group theory in mathematics or the invention of dynamite? The invention of group theory in mathematics – 1830, Evariste Galois – came before the invention of dynamite – 1866, Alfred Nobel. 8. The discovery of new forms of life at deep-sea vents or Moore’s Law of silicon chip processing power doubling every two years? Moore’s Law – 1965, Gordon Moore – came before the discovery of new forms of life at deep-sea vents – 1977, Robert Ballard and John Corliss. 9. The invention of the mercury thermometer or the discovery of the planet Uranus? The invention of the mercury thermometer – 1714, Daniel Fahrenheit – came before the discovery of Uranus – 1781, Sir William Herschel. 10. 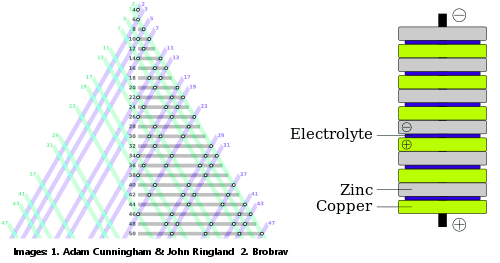 The Goldbach Conjecture or the invention of the electric battery? The Goldbach Conjecture – 1742, Christian Goldbach – came before the invention of the electric battery – 1800, Alessandro Volta. 10 out of 10. When it comes to the history of science, you are an Einstein. 8 or 9 out of 10. Not quite Einstein, but enough for a Nobel Prize. 7 out of 10. No prizes, but definitely a professor in the making. 5 or 6 out of 10. A little more effort, and you’ll be up there with the best of them. 4 or less. Ooops. Guessing the answers at random will usually give a better result than this! Electric batteries ~3000 yrs old have been found in Egypt, so I consider your answer to that (last) question incorrect which brings my score to 10.
thanks because I learn more things from the information of the scientists. I first read about these batteries when I was 10 in Chariots of the Gods. I believed at the time but I’m a lot older now and I don’t any more. Einstein. I wasn’t quite sure about the infrared and rabies vaccine question, but I went with what I believed a little more, the infrared. Would never have thought infrared came before the rabies vaccine… that was the only one I got wrong.